The remaining employment land at the former Maltby Colliery in Rotherham is being promoted by landowners, Hargreaves Services. The 500 acre colliery was mined for over 100 years until geological conditions could not be overcome and underground operations ceased in 2013. It had been expected to continue coal production until 2025 but the winding tower was brought down in 2014 and the mine shafts have been filled and capped. With the sudden closure, a restoration scheme was developed and future uses were examined through the borough's new Local Plan. Hargreaves Services has recently established a new division, called Hargreaves Land, which aims to bring forward developments and unlock value from the group's 17,500-acre land bank, which is valued in excess of £50m. 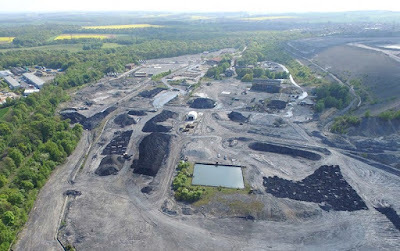 The company's UK-wide land portfolio includes over 50 sites ranging from former coal mines undergoing remediation, through to prime consented sites ready for development. At Maltby, Hargreaves is working with consultants WYG on a masterplan which is due to be submitted in Autumn 2018. With the Local Plan being adopted, around 80 acres is being made available for commercial/industrial uses around the former pit head. Through the local plan hearings, the company had suggested that land at Maltby could be suitable for lower density uses, "including potential use by an aggregates business, construction firm or other larger scale occupiers." With rail infrastructure on site, representations for Hargreaves add that it "is likely to help to attract interest for waste (including reverse logistics and recycling facilities), energy, industrial or other "bad neighbour" type uses from a wider catchment." For the majority of the site, a reclamation scheme has been approved that will see the Green Belt returned into woodland and grassland. The new brochure for the site, drawn up with agents at Knight Frank, shows nine available plots and states: "The plots would be suitable for a variety of associated uses and ancillary opportunities such as waste processing, aggregates, composting and green energy projects." Rothbiz understands that an international firm which hosts auctions for large scale plant and machinery has previously shown an interest in the site. Hargreaves land added: "We are actively seeking to work with prospective occupiers to facilitate the re-use of the land and premises for employment purposes. "Adjacent land, which is also within Hargreaves Land control, has been successfully promoted as a potential housing site."